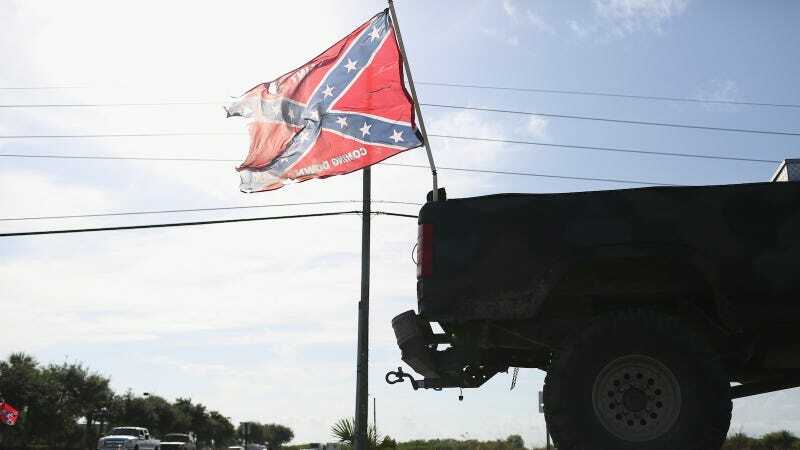 Here’s your annual reminder that there are still a handful of states in America that celebrate the former existence of the Confederacy, a dark chapter in American history when black people were considered three-fifths of a human being and were enslaved to make rich white men richer. State governments in Mississippi and Alabama are closed on Monday for Confederate Memorial Day (or as I call it, Racist Pride Day), while Georgia is celebrating the same joyous occasion simply as a “state holiday,” disassociating the day from the pro-slave history it celebrates. Per the AP, the holiday “commemorates those who died during the Civil War while fighting for Southern states that tried to secede from the U.S.” The AP also reminds Mississippi and Alabama that they wished to secede from the US specifically to create the “Southern Slaveholding Confederacy.” So if Bryant and his ilk are doing any “reflecting” on the Confederacy, I highly doubt it’s about the legacy of slavery and the need for reparations. On a (slightly) more positive note, CNN reports that the first of four scheduled removals of Confederate Memorials in Louisiana, another former Confederate state, took place early Monday morning. However, as one observer in New Orleans told WVUE-TV, “This should be a celebration but instead this is done clandestinely. They got the workers who are taking it down dressed in black jackets, helmets and their faces are covered, to us that’s cowardice.” Also, Louisiana continues to have its own Confederate Memorial Day, which takes place on June 3.